Interested in pilgrimage? 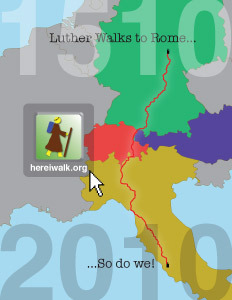 Interested in meeting some modern pilgrims? Then the upcoming “Here I Walk” presentations are for you. 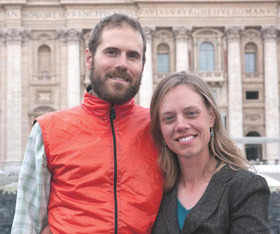 Andrew and Sarah Wilson will present “Here I Walk: With Luther from Erfurt to Rome” at the Augsburg College Founders Day Reformation Lectures, November 10 and 11 in the Hoversten Chapel, Foss Center. Editor’s Note: Andrew and Sarah Wilson will be presenting about their pilgramage at Augsburg’s Founders’ Day celebrations, Nov. 10-11.